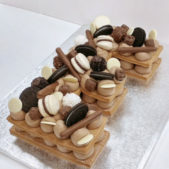 Cream tarts are the latest cake craze to hit the yummy dessert scene and at Cakes by Robin we are embracing these delicious treats just as passionately as any of our other cake, cookie and dessert table creations. At Cakes by Robin we love a cake challenge, so we’ve been busy creating cream tarts for our discerning cake clients who are on the look out for something fresh and new. We are delighted to say this indulgent, gorgeous cake craze isn’t going away. At least not in our cake-loving kitchen it’s not. If you want to surprise your loved one with a special treat, a cream tart is definitely the way to go. 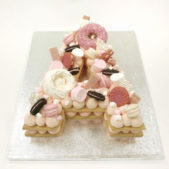 Cream tarts are perfect for any celebration and are a popular alternative to traditional cakes. So, what exactly are they? Well, they are kind of a cross between a cake-sized biscuit and a cake, sandwiched with cream and topped with amazing treats. Our cream tarts are made from two layers (or more if you like) of our special recipe cakey dough (not quite cookie and not quite cake). The baked cakey treat layers are then filled and topped with a yummy cream filling (another of our secret recipes that sends us into a scrumptious spin here in the cake parlour). Then the whole thing is topped off with a mountain (or sprinkling) of sweet treats from juicy berries, mini meringue kisses, colourful macarons and icing sugar petals, as well as real flowers too. WHAT DO CAKE TARTS TASTE LIKE? Trust us when we say these trendy treats taste just as heavenly as they look. These are definitely cake alternatives that little girls’ dreams are made of – sugar and spice and all things nice! We’d say these new and beautiful cream tarts are a hipper and trendier version of the classic fruit tart, with a unique cakey twist. If you love cream, cakes, biscuits, sweets and fruit, you won’t find a better combination of all of these in one delicious slice. WHAT ARE CREAM TARTS DECORATED WITH? There are no rules when it comes to decoration, so if you fancy buttercream, pastry cream or stabilised whipped cream, and any fruits, sweets, marshmallows, or other tasty toppings, we can bring your cream tart dream to life. If you are chocolate lover and hate fruit, it’s no problem. We can do a fantastic chocolate version too. WHAT ABOUT SHAPES AND SIZES? Choose numbers, letters, heart shapes (or indeed any shape you like) for the design. We can make a huge cream tart to feed as many as you like or create dainty individual cream tarts to bring something different to your dessert table. If you need help with cream tart design ideas, take a look at our gallery or contact our incredible cake team and we’ll help you come up with a unique cake style. Oh, and we’d recommend you over order. No one can eat just one portion! We’ve tried and it’s impossible. ARE CREAM TARTS A GOOD ALTERNATIVE TO BIRTHDAY CAKE? Cream tarts are a delightful alternative to traditional birthday cakes, but we love both, so it comes down to your own personal taste and preferences. If it’s a big celebration, you could always go all out with a fabulous dessert table and have both, as well as lots of other tasty treats. 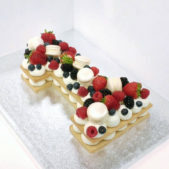 We can arrange for delivery of your cream tart to anywhere in London. Our delivery charges are calculated by post code. If you live outside of London, you are welcome to collect any orders from our cake parlour during opening times. We are just a couple of minutes’ walk from Southfields tube station. Find out more about our cream tart and cake delivery and collection service here.